We were very excited when a few weeks ago the team from Match of the Day came along to one of our Any Old Irons Q&A events to film. You may have caught us on this morning’s (Sunday 6 May) show. This particular Q&A session was with West Ham goalkeeper, Adrián. He spent around 45 minutes taking questions from an audience of 59 Any Old Irons participants. He then took the time to sign t-shirts, programmes and have his photograph taken with many of those who came along. If you missed it, you can watch the piece here. 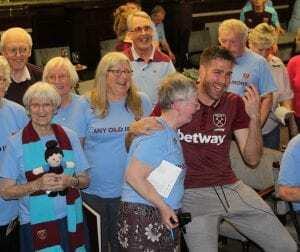 Any Old Irons, part of Football Friends, is a project we run with the West Ham United Foundation to bring together older people over their shared passion for West Ham Football Club. The project runs a range of events and activities centred around a series of five-week programmes, which include stadium tours, digital learning and story sharing. Outside of these cohorts, the group meets regularly for social events and for special Q&A sessions like this one. To find out more about Football Friends and Any Old Irons, click here.